Middle Atlantic Products has secured patent number 9,301,605 from the U.S. Patent and Trademark Office for its Essex QAR Series Rack. Featuring an innovative approach to rack design that speeds up integration and assembly, the Essex QAR Series Rack enables AV contractors to focus on multiple projects during their workday. "Middle Atlantic is dedicated to optimizing the integration process and creating solutions that simplify installations and make the lives of our customers easier. The simplicity of our Essex QAR Series Rack is a direct expression of that philosophy," said Keith Carney, vice president, engineering at Middle Atlantic. "This patent is a great recognition of our commitment to delivering a high-quality infrastructure solution." 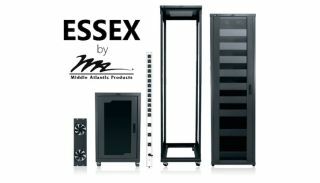 The Essex QAR Series Rack is an easy-to-build knock-down rack. It features a patented snap-together design, making it integration-ready in five minutes or less and saving up to 30 minutes or more in assembly time compared to other knock-down racks. Providing a high-quality foundation for AV systems, it can be used as a skeleton rack or easily configured with sides, doors, and a range of Essex power and accessory options. It is UL-listed with models available in 12 sizes to complement a full range of AV systems. Ideal for installation in a variety of spaces, it is optimized for efficient cable management with generous facilities for bottom cable entry. All Essex QAR Series racks feature lockable casters, optional leveling feet for fixed installation, and a convenient mounting bracket for vertical power distribution.